Call Laura Nashman at 416-924-8180 to order. Feel free to ask Laura any questions or wholesale prices for bulk orders. A pleasant scent keeps the essence of plants and flowers awake! At 2.5 million ultrasound vibrations per second, this aromatic machine releases the refreshing essential oil into the air. 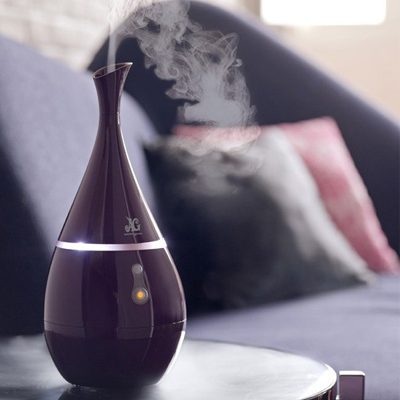 Four functions of humidifier, purifier, ionizer and night lamp in one, producing a hydro-oxygen SPA and enhancing the effect of aromatherapy by breaking up water and essential oil into fine mist of millions of micro-particles. a. Green Mode continuous operating mode: each cycle lasts for about 2 hours with one-time water filling. b. Orange Mode 30s on/30s off mode: each cycle lasts for about 5 hours with one-time water filling. Built-in water level sensor avoid operation with insufficient or no water. The calming LED atmosphere light works as a wonderful night lamp.